The area’s best stand-up comedians will join forces for a one-time event to benefit the Alzheimer’s Association of North Eastern New York. 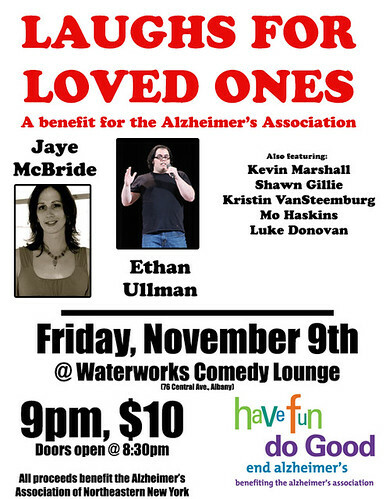 Laughs for Loved Ones will be held on Friday, November 9th at the Waterworks Comedy Lounge (76 Central Ave., Albany). The show starts at 9pm with doors opening at 8:30pm. The cost for the event is $10 with all proceeds going directly to the Alzheimer’s Association. Headlining the event are crowd favorites Jaye McBride and Ethan Ullman. Jaye has been seen literally coast to coast, from the Laugh Factory and Comedy Store in LA to Caroline’s in New York City. Locally, she serves as the co-host and co-producer of the monthly Laughs on Lark showcase, which occurs on the second Wednesday of every month at Elda’s on Lark in Albany, NY. Ethan is the host of Alternative to Sleeping, a weekly comedy program that can be heard on WCDB 90.9FM and alt2sleep.com, and has opened for Todd Barry, Brian Posehn, and Doug Stanhope, among others. Other local comics on the lineup include Kevin Marshall, Mo Haskins, Kristin VanSteemburg, Luke Donovan, and Shawn Gillie. The event is being organized by Kevin Marshall. Waterworks Pub is providing the facility for the event free of charge. The Alzheimer’s Association of Northeastern New York seeks to advances research, provides and enhances care and support for those stricken with the disease and their loved ones, and seeks to reduce the risks associated with dementia through the promotion of brain health. More information is available at their website: http://www.alz.org/northeasternny/. For more information, please contact Kevin Marshall at deputymarshall@gmail.com or call 518.892.0577.